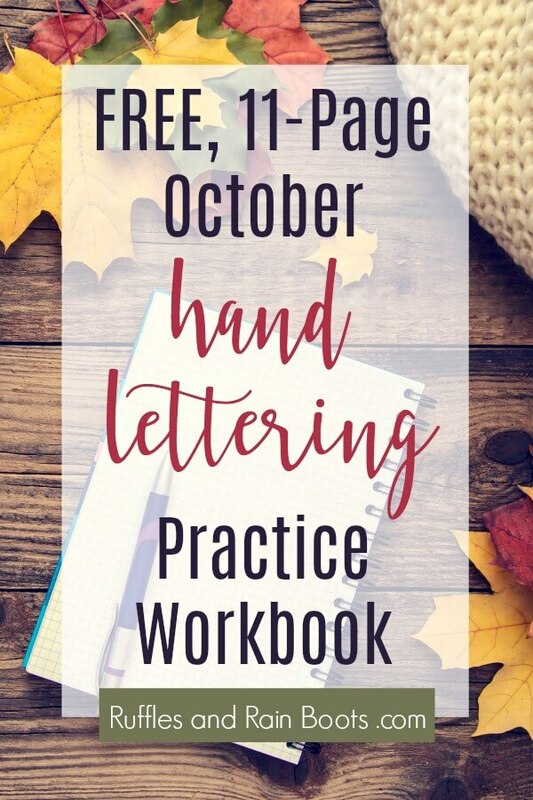 The October hand lettering practice workbook is here, full of eleven pages of free hand lettering practice in 3 styles. Grab your pens and let’s get started. I cannot believe we’re already to October! 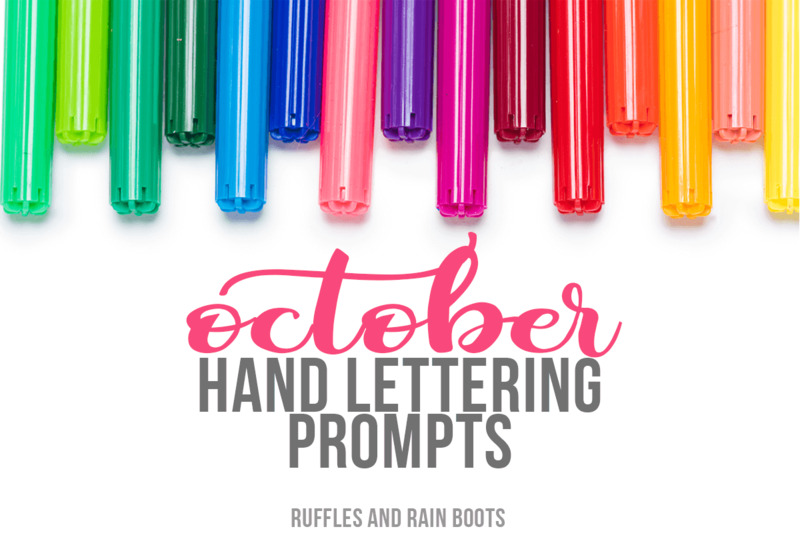 If you’re just starting with our free hand lettering monthly prompts series, don’t be shy. Join us over on the Ruffles and Rain Boots’ Facebook page and introduce yourself. Let me know where you are in your practice and what you’d like to see. Fall is here and we’re kicking off this month with a list of prompts that’ll have you sighing to welcome in the changing seasons. From “Things that go bump in the night” to “Never stop dreaming,” we have 31 days of lettering fun. RELATED READING: Print Off This Fun Mermaid Lettering Practice! If you’re new to hand lettering, you might not know one of the basic techniques which will improve your lettering immediately. Always be sure to hold your pen at a 45(ish) degree angle when lettering. It doesn’t matter if you’re working with large pens (like these) or small pens (like these). When you find yourself slipping up a bit, check the angle. It’s usually my biggest culprit to shaky lines and inconsistent pressure. Psst: check out my Amazon Shop to see what I use daily in my lettering. If you are subscribed to our newsletter, you already have the password (it’s at the bottom of every email I send). Grab that password and get the October Workbook here. Thanks for joining us for a little Fall lettering today. 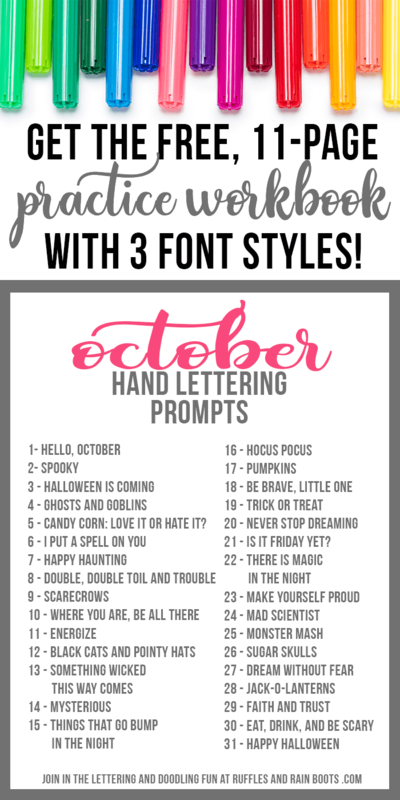 Please share this on Facebook or Pin It for later onto your favorite hand lettering practice sheets board.